Virtually all vehicles come with power steering so many Sturgis auto owners have never driven a car or truck without it. Power steering assists you when you turn your SUV steering wheel. Without it, it would be very hard to steer. Now this power assist comes in a couple of forms. 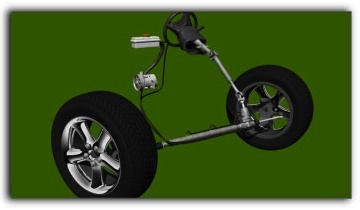 In recent years, a lot of Battle Creek vehicles have an electric motor that reduces steering effort and helps improve fuel economy. The other kind of power steering is hydraulic. This is the kind most older Michigan vehicles, and a lot of newer ones, have. Power steering fluid is pressurized by a pump and is used to assist steering. Of course, Battle Creek auto owners need the right amount of fluid in the system. If it’s too low your steering is affected and you could damage your SUV pump. Also, power steering fluid can become corrosive over time and damage the pump, hoses and connectors; leading to leaks and repairs. Power steering service at Tuffy Sturgis in Sturgis includes removing the contaminated fluid and replacing it with fresh fluid. A word about power steering pumps: Some are powered by an electric motor. Others are driven by the serpentine belt. A worn serpentine belt stresses all of the SUV components it drives, including the power steering pump, so replace the belt at Tuffy Sturgis as advised to avoid undue repairs. Losing your power steering while driving in Sturgis can be unsettling – just remember that you can still steer, it’ll just be harder. Check with your friendly Tuffy Sturgis service professional to see if it’s time to service your SUV power steering system. In addition to power steering service, at Tuffy Sturgis we offer comprehensive automotive services including brakes, muffler and tires.